Melbourne’s rainy season is upon us. It’s been a few years since my blog post about good strong compact umbrellas, so here’s a quick update. A good umbrella is vital for a dedicated walking/PT person. The brief: an umbrella that, folded, can fit in my work bag (eg a maximum length of about 35cm) and go anywhere. And — this is the hard bit — as durable as possible. 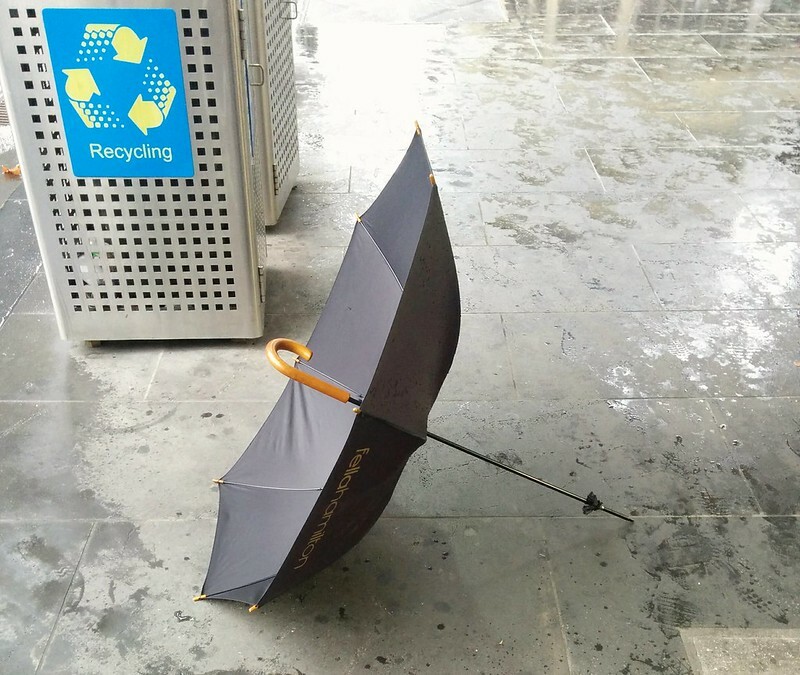 Foldable umbrellas tend not to be made of the strongest material due to compactness, and what I don’t want is it falling apart when caught in the rain. I did buy a Senz Mini. It went well for a while, but then part of it got bent out of shape, and it wouldn’t close properly. It was replaced under warranty. I had also bought Marita a Senz Mini. It lasted a bit longer (out of the warranty period! ), but she had some similar problems with it. Then I lost mine… and bought a newer model, the Senz Mini AO (the acronym standing for Auto Open, not Adults Only). So far, that has been fine. I wouldn’t be surprised if they have upgraded the parts we had issues with. In fact the Senz AO has subsequently been replaced by the Senz Automatic and the Senz Smart S (a budget version). As with all the Senz models, the shape of it (with the handle set forward, rather than in the middle) means good coverage, even for a relatively small design. And when folded, it’s very compact; about 28cm long. It’ll stick out, but can go into a pocket. When M’s Senz was becoming too problematic, I bought her a Blunt XS Metro to replace it. Feedback from her and others suggests there are pros and cons here; in comparison with the Senz foldable umbrellas the coverage is less, and the folding mechanism isn’t as compact, meaning when not being used it may not fit in some bags. But the Blunt models do seem to be constructed to a high standard, making them very durable. There’s also a variant of this one: the Blunt XS Metro + Tile, which has a Tile inside it, a chip designed to prevent it being lost. When activated it can play a tune so you can find it. It can also tell you via the app where you last saw it (I’m guessing this simply tells you where you were when your phone was last in range of it). It might help you find it if lost somewhere static. Not sure it’d help if (like I did) you leave it on a train. Is there a perfect compact umbrella? The Blunt looks like it is tougher (fibreglass ribs vs the Senz’s aluminium and steel). But the Senz is more compact when folded (Senz 28cm vs Blunt 36.5cm, and while the canopy is slightly smaller, the shape and handle position provides better rain protection. Surfing around the net I did find this: the Gustbuster Metro (A$64) got a good review. This Metafilter thread also has some suggestions. Has Choice reviewed umbrellas? Judging from their web site and their paper magazine index, apparently not. Anybody know some other contenders for the perfect, durable, compact umbrella? Just do us all a favour: don’t bring out the golf umbrellas on busy city streets. They belong on the golf course. Knirps are good. I have one of these: http://www.knirps.com/en/folded/mini-ultralight , but they have other models. Mine is almost 6 years old now and it’s still going strong. Not sure if you can get them here though, I bought it in the US. I think by design there might be a case of diminished reliability and durability when it comes to compact/folding umbrellas. Late last year I was in the Netherlands (Senz is Dutch) where it was very easy to compare all the Senz umbrellas side-by-side in a shop using a wind machine. The compact umbrellas didn’t look or feel as sturdy as their stick models. Despite that, I bought an Automatic that I have used both there and in windy Sydney without problems. @jon, I notice some Knirps umbrellas are on the James Smith web site, and they will ship overseas. Obviously there might be other online ordering options. It is inadvisable to lend your James Smith umbrella to even your closest friend. Give them our address instead. I know I abhor a “buy and throw away” mentality, but some umbrellas are so compact and cheap that you can buy two and fit them in your bag. That being said, they don’t make them like they use to. I bought a no-brand compact umbrella in Singapore some 2 decades ago and it is still in decent shape. It must have been built for tropical conditions because it’s the one I’ve carried with me for a long time. To be fair though, when I’m prepared for a rainy day, I carry another el-cheapo full size umbrella bought from a shop in Chinatown and use that instead of my compact. It has a telescopic plastic cover that allows the umbrella to close up nearly water-tight when not in use and won’t attract stares from other people who aren’t happy with those who leave a trail of water walking indoors with their still wet umbrella. I’ll put in a good word for the Korjo umbrellas. After 2 years of Melbourne conditions mine was still going strong, until I left it behind just a little too long on a seat at a tram stop on Sunday afternoon. Was originally $19.95 from OfficeWorks, now $24.99 as I discovered when I went straight back to OfficeWorks to buy a replacement that same afternoon. Instant opening with auto switch; folds down to 28 cm and fits in both my winter handbags. I support Arfman re “buy and throw away”. Researching umbrellas I came down to Senz or Blunt. Senz seemingly unavailable in Melbourne circa 2012 so I purchased a Blunt XS Metro from Hunt Leather? in Collins St. Price was $79.00. Still going strong 4 years later and Cost of ownership now about $0.40 per week and decreasing! Overall an excellent piece of functional design. I’ve been using a James Smith Best Folding Hazel Root for 6 years in London and it looks as good today as the day I bought it. It’s 42cm long, so protrudes out my laptop bag by about 10cm.not cheap at about £150, but I expect it will last me another 10-20 years. Before the James Smith I used to buy upon need, £3 a pop, frequently having 5 or 6 on the go, maybe 3-4 a year. Still a valid option. Regarding Senz availability in Melbourne, Top 3 was stocking them back in April. I assume it’s still the case. Have you seen the youtube videos about KazBrellas? They sound quite good to me; but for me, personally, I just stock up on small folding purple umbrellas whereever and whenever I find them; if one breaks, I just chuck it out and get out another one from the collection.